Custom Frameless Glass Showers & Doors - Beauty & Elegance! Showcase: The CRL Serenity Sliding Glass Door Shower System! Nothing beats Frame-less Glass Showers for timeless beauty and elegance that never goes out of style. After the kitchen, bathroom improvements are the single best investment in your home's value. 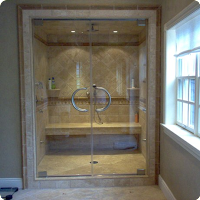 From new shower frames to frame-less glass shower stall or bathtub enclosures, we can design and install a bathroom shower glass enclosure system that will give you years of enjoyment and pleasure. Why settle for cheap shower curtains or out of the box, one-size-fits-all systems that break, sag and never properly fit right in the first place? 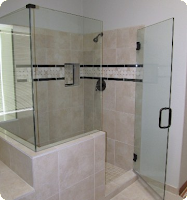 Our Frame-less Shower Glass Doors and Enclosures are custom designed to fit your exact shower stall and tub. Solid enough to last a lifetime! Remodeling your bathroom? 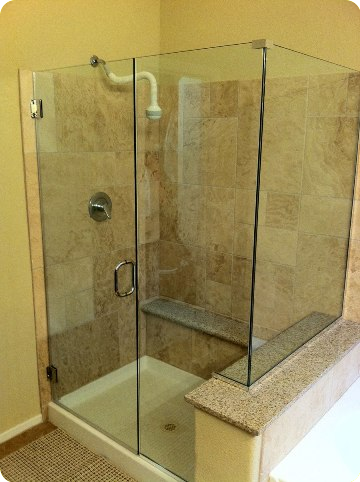 Homeowners in the Seattle Eastside area have many choices in glass shower and bath tub enclosures. 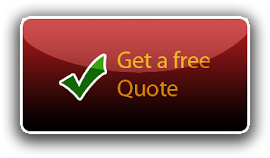 With Window Defoggers, Interior Designers, Builders and homeowners can easily create custom shower doors and enclosures for bathrooms, limited only by their imagination. 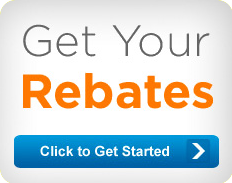 We're here to help with professional advice on bathroom shower doow and tub options as well as their installation. Glass shower doors and bath enclosures create an inviting appearance and bathing experience. Shower doors come two basic types: Hinged and Sliding. Hinged shower and bath doors connect to shower wall enclosures and operate by hardware hinges. The doors typically swing outward into the bathroom. Hinged doors stay closed with a magnet or latch mechanism. Hinge doors can be single or double doors. Sliding glass doors are set into metal tracks. Typically it's two sliding doors that slide past each other to make the enclosure. Towel racks across the middle double as handles for sliding the doors open and closed. Sliding doors are useful where space is tight, while hinged doors are recommended when space is plentiful. 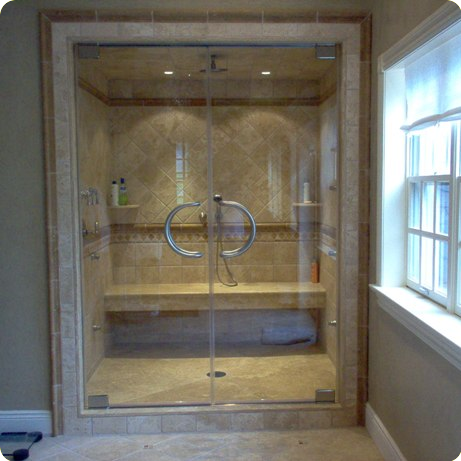 Glass enclosures forshowers and bathtubs are made from much thicker glass than windows. 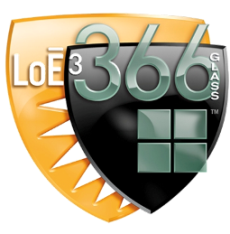 On frame-less enclosures, the glass is even thicker and of more durable quality. The glass is always tempered for ultimate safety in the bathroom. The glass typically comes in clear or but is also available in different textures and patterns. 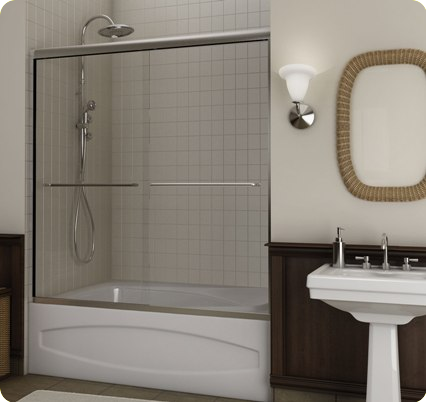 Glass Thicknesses from 3/16", 1/4" or up to 3/8" & 1/2"
Custom glass shower doors and enclosures are available to in nearly any size, style and combination your imagination can provide. 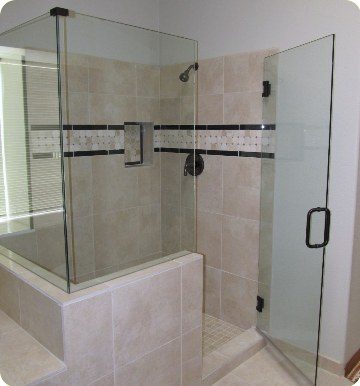 Installation is quick, seamless and the finished glass enclosures will have you "singing in the shower!"